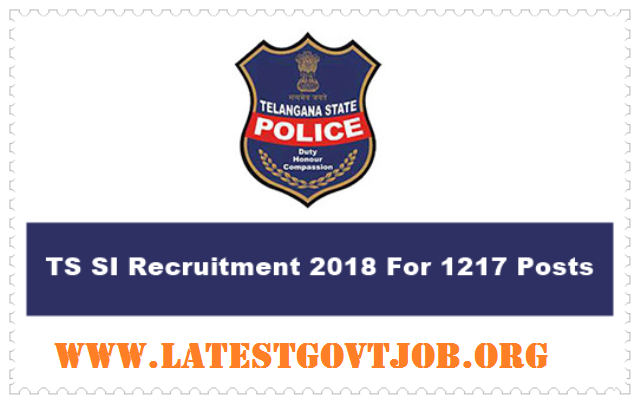 TSLPRB Recruitment 2018 for Sub Inspector and More 1217 Vacancies @tslprb.in : Telangana State Level Police Recruitment Board (TSLPRB) has released a notification for the recruitment of 1217 Sub-Inspectors and more. Interested candidates may check the vacancy details and apply online from 09-06-2018 to 30-06-2018. Selection of candidates will be made on the basis of Preliminary Examination, PMT, PET and Main Examination. General/UR/OBC candidates have to pay Rs. 1000 and SC/ST candidates have to pay Rs. 500 through online mode using Net-banking/Credit or Debit Card. Interested and eligible candidates may apply online through TSLPRB website - http://tslprb.in/ - from 09-06-2018 to 30-06-2018.